a penetrating and revelatory inquiry into how forces within the American political, economic, and military systems have come to undermine the carefully crafted structure of our republic -- upsetting its balance of powers, vastly strengthening the hand of the president in taking the nation to war, and imperiling the workings of American democracy. This is a story not of simple corruption but of the unexpected origins of a more subtle and, in many ways, more worrisome disfiguring of our political system and society. 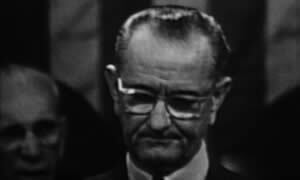 In his farewell address 47 years ago, President Eisenhower identified the "conjunction of an immense military establishment and a large arms industry" as both new and far- reaching. Its influence was not just military but "economic, political, even spiritual" thus involving "the very structure of our society." Bringing to light the connections through which the military-industrial complex extends its influence throughout American culture is what made the Why We Fight documentary so effective. The "spiritual" aspect -- broad but very real ways -- comes through with depth and poigniance. If The American Way of War reinforces and extends the quality of analysis found in the documentary, it will be an exceptionally valuable book. Neither a reader of Crile, nor a viewer of the film based on his book would know that, in talking about the Afghan freedom fighters of the 1980s, we are also talking about the militants of al Qaeda and the Taliban of the 1990s and 2000s. Amid all the hoopla about Wilson's going out of channels to engineer secret appropriations of millions of dollars to the guerrillas, the reader or viewer would never suspect that, when the Soviet Union withdrew from Afghanistan in 1989, President George H.W. Bush promptly lost interest in the place and simply walked away, leaving it to descend into one of the most horrific civil wars of modern times. My own view is that if Charlie Wilson's War is a comedy, it's the kind that goes over well with a roomful of louts in a college fraternity house. Simply put, it is imperialist propaganda and the tragedy is that four-and-a-half years after we invaded Iraq and destroyed it, such dangerously misleading nonsense is still being offered to a gullible public. The most accurate review so far is James Rocchi's summing-up for Cinematical: "Charlie Wilson's War isn't just bad history; it feels even more malign, like a conscious attempt to induce amnesia." Chalmers Johnson, "Imperialist Propaganda: Second Thoughts on Charlie Wilson's War," at TomDispatch, January 6, 2008. 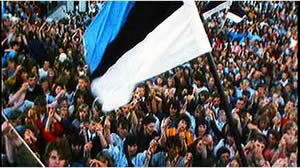 In Estonia, song was the weapon of choice when, between 1986 and 1991, hundreds of thousands of Estonian people gathered to sing forbidden patriotic songs and rally for independence, risking their lives to proclaim their desire for a free Estonia. "The Singing Revolution" is a documentary film that tells the story of the non-violent path Estonia took to free itself from Soviet occupation. Watch the trailer and find out more at www.singingrevolution.com. Thanks to Greg Schneider of Pacifc Union College for forwarding information on this. This segment, along with a report by journalist Evan Derkacz, can be seen at AlterNet: http://www.alternet.org/story/44920/. Additional segments, screening information and much more at the film’s web site: www.encounterpoint.com . Julia Bacha, co-director and writer/editor, recently co-wrote and edited the critically-acclaimed documentary, Control Room, about Al Jazeera, for which she was nominated to the 2005 Writer’s Guild of America Award. Nahanni Rous, producer, played a key role in selecting, interviewing and building relationships with Encounter Point’s film subjects, and in shaping the film throughout the editing process. Ronit Avni, director/producer/executive producer, is also founder and director of Just Vision, a non-profit that widens the influence of Palestinian and Israeli grassroots peace builders. Joline Makhlouf, producer, is the East-Jerusalem-based project co-manager at Just Vision. She has worked as a facilitator at Face to Face/Faith to Faith, Building Bridges for Peace and Seeds of Peace, all of which bring together youth from conflict zones around the world.